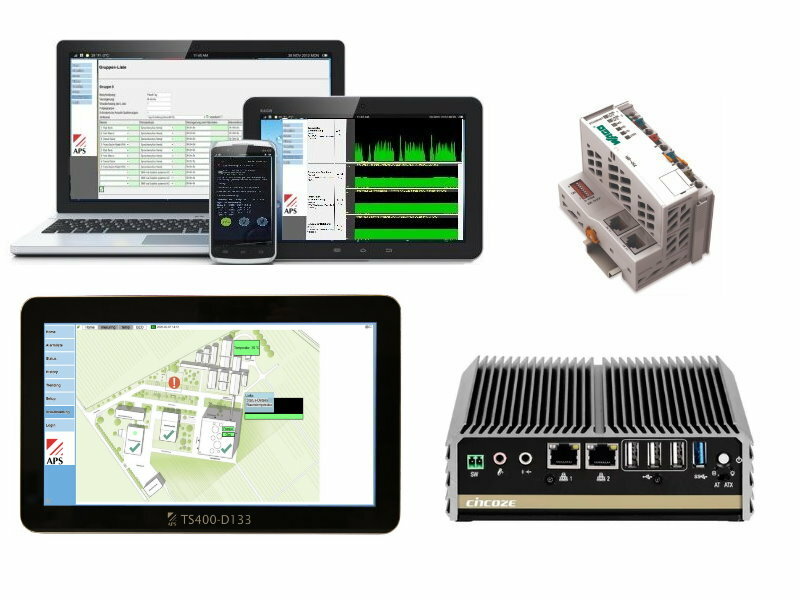 The fault indicating and building automation system TS400, in compliance with DIN 19235, offers the perfect platform to monitor predominantly technical systems and plants. 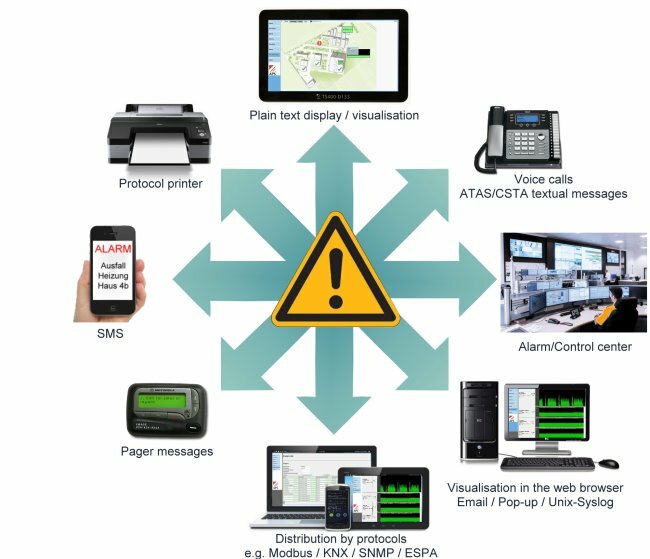 Thanks to the integrated visualisation and the save alarm chain your infrastructure is alway under control. The access for monitoring and configuration is with a web browser either directly in the CPU or with a computer within the network. All system access can be password-protected. The menuoperated parameterisation does not require any in-depth programming knowledge due to visualisation. The data is collected by a wide variety of analogue as well as digital inputs from the low-cost Wago range. 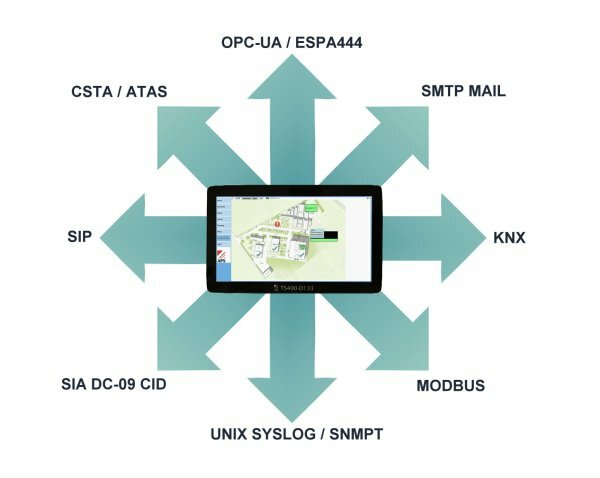 Interfaces such as ESPA444, Modbus, Unix-Syslog or SNMP-Traps can be imported and processed too. A multitude of media is available to indicate any faults occurring. The TS400-DM operator modules will give you up-to-date information in plain text about all system status and fault indication messages. Any alerts may also be sent in form voice message, fax, SMS, email or pager message to predefined groups. Local nodes are connected via the usual networking KAT 5 and are therefore easily integrated into the exsisting infrastructure. 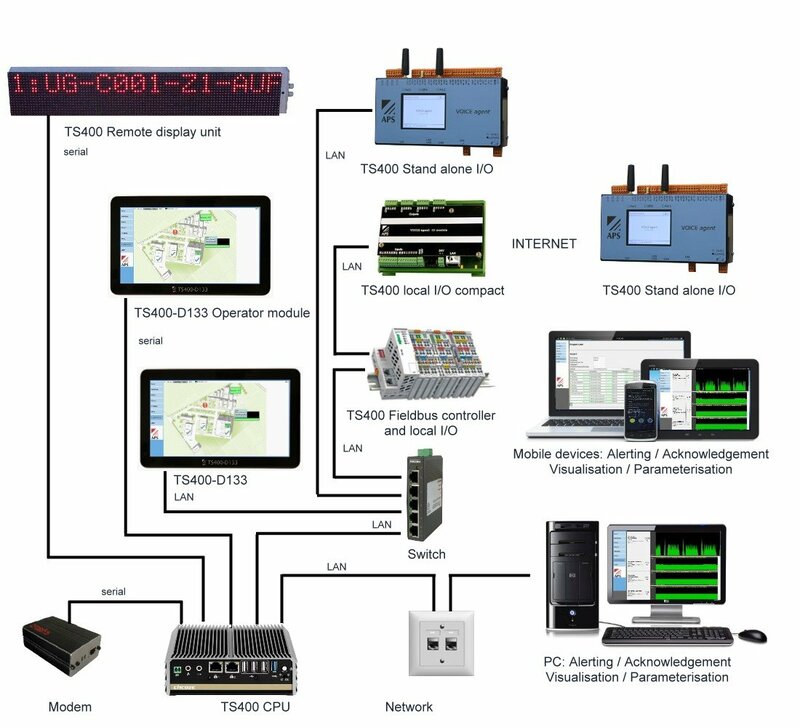 Master control unit with 2.4GHz clock frequency and 120 GB RAM. All events are recorded in log files and can be viewed and evaluated. The CPU can manage up to 128 nodes and 16 TS400-DM operator modules. It ensures communication between all system components using standard network technology (Ethernet Cat.5). The CPU is also the platform for the visualisation / SCADA. Thanks to its flat design, this display- and control module can be mounted directly onto the front panels, or alternatively onto the work surface via a stand. The TS400 DM Operator module LAN displays all messages in plaintext. When an alarm arises, the integrated acoustic alarm is also sounded. The panel buttons can be used to acknowledge alarms and view the log file containing the last 1,000 events. The TS400-DM Operator module LAN is integrated in the network and supplied by power over ethernet. Thanks to its flat design, this display- and control module can be mounted directly onto the front panels, or alternatively onto the work surface via a stand. The TS400 DM Operator module serial displays all messages in plaintext. When an alarm arises, the integrated acoustic alarm is also sounded. The panel buttons can be used to acknowledge alarms and view the log file containing the last 1,000 events. The TS400-DM Operator module serial is connected to the serial interface of the TS400 CPU Processor. The TS400 remote display unit is a large-size LED display unit for displaying alarm text that can be read from a distance of up to 80 metres. Positioned upstream, the TS400 Fieldbus controller is the intelligent starting point of each and every node. Up to 128 nodes can be used in the system. Each of these are supplied locally. Each controller can manage 2000 digital or 1000 analogue I/Os. The connection to the TS400 CPU Processor is realised with Ethernet. The TS400 Fielbus controller is expanded with the TS400 Local in- output modules. Thanks to the integration of tried and trusted WAGO I/O technology, a broad range of inputs and outputs are available. Mostly all variants belonging to the 750 series can be used. This means an optimal, space-saving and cost-saving solution is available for all voltage variants. The data transfer to the TS400 Feldbus controller is realised with an internal bus. The VOICE agent can be used as an autonomous input module for the TS400 system. By doing so, you can achieve an autonomous and redundant alarm generation route in addition to the input acquisition. The network is used to connect to the TS400 CPU processor module. The TS400 GPRS in- output modules are used to connect remote stations or remote infrastructure. EX-101 expansion modules are available for the MT-101 controller with integrated modem. The connection to the TS400 CPU Processor is realised over the GPRS network. An additional communication option is remote access over the Internet. After logging in, users can monitor the actual status of the system. Any alarms that occur can be acknowledged. Various log files can be called up to view all alarms which arose in the past and how they were responded to. The detailed configuration is entered by clicking on the graph. In this sub-menue it is possible to edit the graph, export the values as CSV file or query past values. 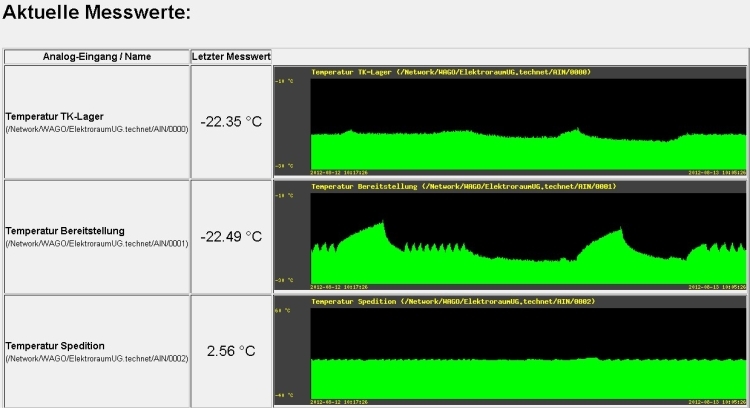 Moreover, it is possible to visualise analogue values example given the actual temperature of the server room. 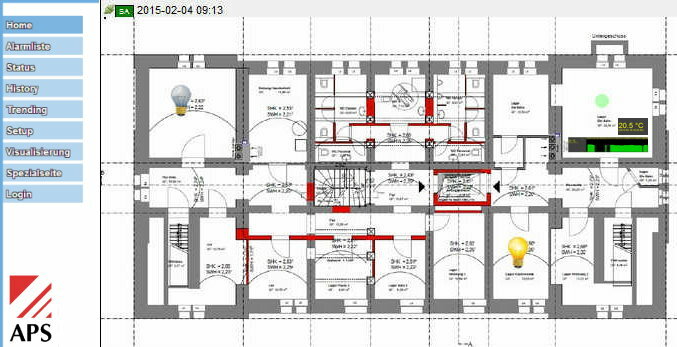 Integrating switch buttons in the visualisation allows the user to control digital outputs. Since all the programming takes place fully in the browser, there is no need to purchase software and updates. The configuration comes with graphics and is menu-based. The system can be programmed using any network PC, or a laptop connected to the switch. Participants are divided into groups for the purpose of alerting. 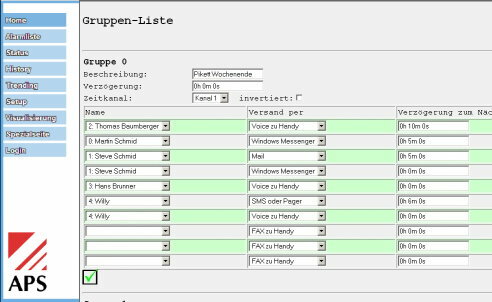 Each entry may have a short text message (SMS) or long fax message as well as a language profile assigned to it. Otherwise, the TS400 will create a voice messages using the built in Text-to-Speech-Engine. The fault indicating system TS400 includes a timer with numerous integrated functions. There are channels for weekdays, public holidays and other special days. These channels may be used to control how the alerts are being transmitted. There is also an option of disabling inputs or to switch outputs directly. Outputs are controlled according to fault indicating procedure DIN 19235 or via direct links.